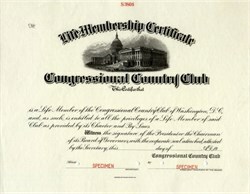 Beautifully engraved SCARCE membership certificate specimen from the Congressional Country Club . 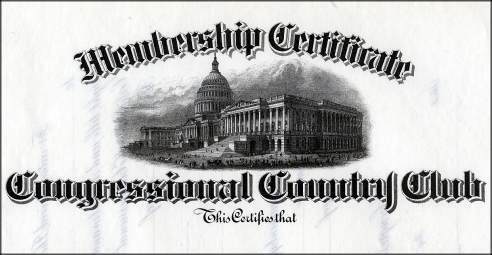 This historic document was printed by the American Banknote Company and has an ornate border around it with a vignette of the the capitol building in Washington DC. A prestigious private Country Club with 3,500 members offers a variety of amenities to its constituency, including elegant fine dining, casual dining, snack bars, swimming pools, bowling alleys, 36 holes of golf, tennis, private meeting rooms, overnight sleeping accommodations, social activities, and banquet/catering/parties. The Congressional Country Club has been the site of the 1964 U.S. Open, 1976 PGA Championship, 1995 U.S. Seniors Open, is ranked in the top 100 golf courses in the U.S.A. and the host of the 1997 U.S. Open.